Over the past 22 years, Of One Accord has grown into a network of three food pantries, serving all of Hawkins and Hancock Counties, with locations in Church Hill, Rogersville and Sneedville. Families and individuals experiencing hardships or a sudden loss of income due to unemployment, death, divorce, and so forth. Must live within Hancock County. Need to have an income of 125% poverty level or below. Click here to determine if you fit into this income level. However, if your household income is just a little over the amounts listed, don't fret. 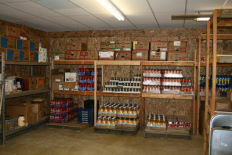 We may still be able to serve you, just complete an application and bring it to the food pantry that serves your area. An intake counselor will discuss your need and make a determination at that time. Print out and complete an application form. Click here for printable application. Take it the food pantry that serves your neighborhood on a day that food is being distributed. Bring proof of income and a utility bill showing where you live.